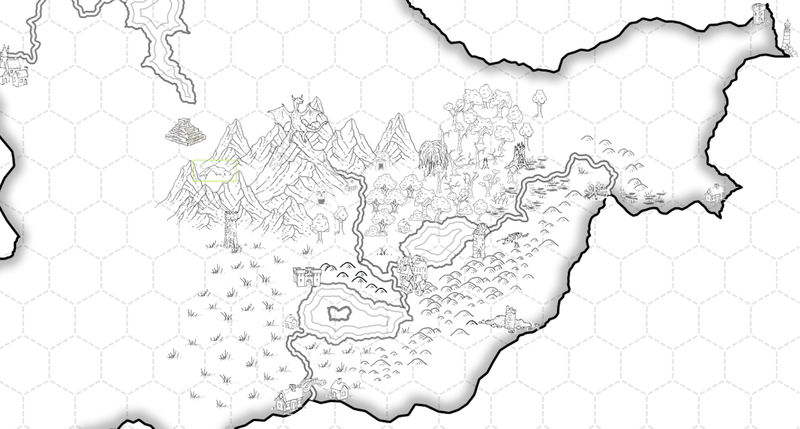 This may wind up being the core map for the Swords & Wizardry: Light Sandbox Setting. If we start the PCs in the town between the lakes and set the hex size to 6 miles across, they have fairly good info on anything in a 25 to 30 mile radius and some general knowledge of locations further out. It leaves undefined space for each campaign to grow with it's own needs. Made in about 2 hrs using the Other World Mapper and graphics from the program as well as those purchased from MonkeyBlood Design. Good stuff. Where does one find Open World Mapper, or is Open supposed to be Other? Sigh. Other World. I'll fix when I get home.